Diane Mead, born and raised in Milwaukee, Wisconsin, attended the University of Wisconsin-Milwaukee, and Pennsylvania State University, studying Computer Science. In 1976, she started at Prudential Insurance, working a multitude of IT jobs and rising to Senior Project Manager before retiring in 2008 after 32 years. As for Dottie Outland, before moving to Delaware, she grew up in the Philly suburbs, always knowing she was gay but not knowing others like herself. 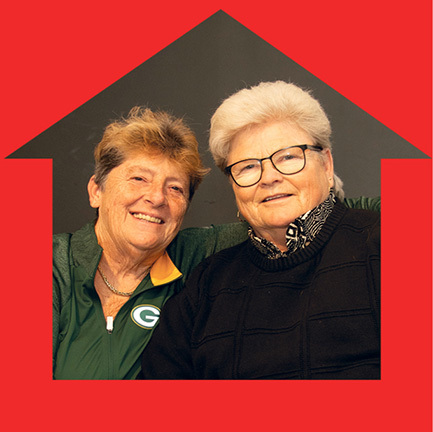 When Dotti began her career at Prudential, she met other lesbians through the company bowling and softball teams. During a 46-year career there and at United Healthcare, Dotti worked a number of jobs, ending her career in Regulatory Affairs. Diane and Dotti got together in 1984 when Prudential sent Dotti to Milwaukee for training and they’ve been partners ever since. For Diane, it was love at first sight. So much so, that she followed Dotti back to Pennsylvania to start a life together. 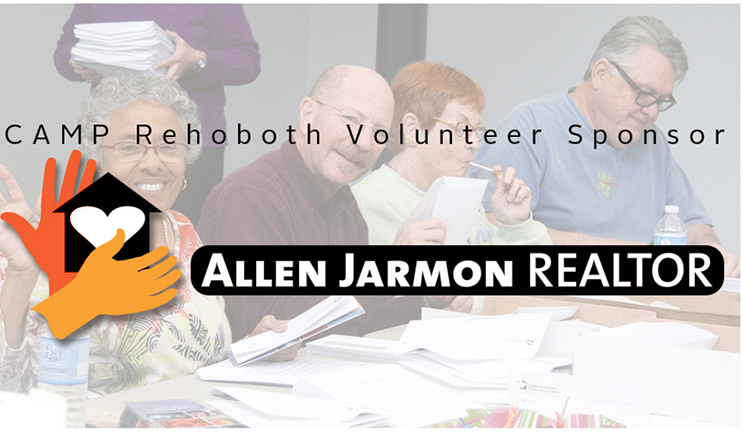 In addition to volunteering for CAMP Rehoboth, they also volunteer for Epworth United Methodist Church in the Soup Kitchen and Food Rescue, CHEER in Milton, and the Immanuel Homeless Shelter. When did you start volunteering at CAMP Rehoboth and for which activities? It was 2014 with Women’s FEST, Sundance, the Block Party, AIDS Walk, art shows, and CROP (CAMP Rehoboth Outreach Program) for the Delaware Food Bank, Therapeutic Riding group, Winterfest, ISOP (International Student Outreach Program) meals, and Immanuel Homeless Shelter. That’s a lot! What’s your favorite event? Sundance. It’s amazing to be a part of such a large event, planned and organized so flawlessly—and one that is so inclusive and successful. Second is Women’s FEST. What’s your best memory volunteering? Dotti: Volunteering for a CROP event at the Southern Delaware Therapeutic Riding center. We worked in the petting zoo with miniature horses and goats. I grew up with goats as pets so I felt at home. Sharing my love for animals with the kids was heartwarming. At CROP we are not only volunteers but ambassadors for CAMP Rehoboth, showing some of the good work done by the LGBTQ community. Name a childhood mentor or someone who influenced you while growing up. Diane: My mom was my most important mentor. She was heavily involved in service work in Al-Anon, working selflessly to help others for many years. I knew I needed to step up and volunteer my services, paying back for the wonderful life I have been given. If you could go back to age 18, what do you know now that you wish you knew then? Diane: That everything is going to be ok.
We love fall. The weather is gorgeous. The tourists have headed home. Parking meters are gone and Tai Chi starts up at CAMP Rehoboth. The LGBTQ community has made significant progress in the fight for equality. Did you expect to see this in your lifetime? Diane: I was raised by a mother who taught me to treat everyone equally. When I came out to her at age 18 that was how she treated me. It was 1975 and I became involved in the fight for gay rights and never looked back. I haven’t spent much time pondering the extent of change I saw in my lifetime. It’s always been a very slow and deliberate process. What I have noticed is how quickly change has occurred in recent years. In part it may be due to social media. We, as activists, are all brought together so easily now. Also, since the dissemination of information occurs so quickly, we are now more educated about what specifically needs to be done to influence change. These tools facilitate action. Although we elders should never give up our involvement in support of gay rights, I think in a way we have passed the baton to a younger generation comfortable with these tools. Dotti: I feel we have made great strides. And accurate coverage of gays in TV, movies, and the press have also helped us progress towards equal rights. Given the current political climate, are you concerned about the possible loss of rights for the LGBT community? Diane: There is definitely concern about losing ground since President Trump’s “base” has proven to be more powerful than expected. Dotti: I agree. We voted like our lives depended on it. What advice would you give to the younger LGBTQ community? Diane: Above all things be true to yourself. Dotti: Be vigilant and get involved in gay rights. Don’t take your rights and freedoms for granted. They can be taken away quickly. Name three events that have shaped your life. Diane: Meeting Dotti, moving from the Midwest to the east coast, and choosing my career. Dotti: Meeting Diane, choosing my career, and moving to Rehoboth. We are both thankful for CAMP Rehoboth and Epworth, living here, and our dogs.